To mark the Flyer's 20th anniversary, we're looking back at stories from our first two decades. 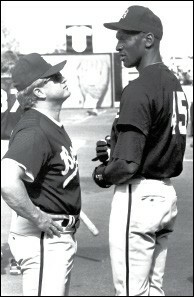 This week 15 years ago, Michael Jordan, then the most famous basketball player in the world, ran out to right field at Tim McCarver Stadium as a member of the Birmingham Barons baseball team, the minor-league affiliate of the Chicago White Sox. Right field, as everyone who remembers recess knows, is where you put the kid who can't play. Jordan the baseball player was that kid, which was a colossal insult to this colossal talent and embodiment of "cool." Jordan the baseball player was not cool. Jordan, only a year removed from his championship form as the star of the Chicago Bulls, somehow got it into his head that he could play major-league baseball. Birmingham was his first stop, which was good news for the Memphis Chicks (the forerunners of the Redbirds). Several thousand fans packed Tim McCarver Stadium and other Southern League venues to watch "Air" Jordan fall ingloriously to earth in June 1994. The Chicks hired 20 extra security guards to make sure Jordan wasn't bothered. As Flyer reporter Dennis Freeland wrote, "The Chicks want to make sure that Jordan is secure and can go about his business during his Memphis visit. There have been few security problems reported on Jordan's Southern League tour. A teenage fan in Nashville ran onto the field towards Jordan but was subdued." After a single season in which he hit .202, Jordan rejoined the Bulls, where he won three more championships. A baseball teammate was reported to have said Jordan could not have hit a curve ball with an ironing board.